Ok, things are totally crazy around here for the next 2 weeks. I have a big enough blog-post stockpile that I should keep up but some things are going to have to wait until later such as my May reading challenge check-in and the Guardian Challenge prize drawing. Of course, now that I've said that, it will probably happen tomorrow. Alrighty, here are the last of the Cybils shortlist for MG/YA Nonfic! Ok, now there wasn't a lot in here that I didn't already know, but some of the finer points didn't come out until high school or college, so there's probably more in here than most 6th graders know. Lots of information, but presented in an engaging and funny way. The illustrations are cartoony/characterture istic in style, which adds to the fun. I especially liked the end material. There's a chapter called "Whatever Happened to...?" that details the post-Revolutionary lives of many of the people discussed. There's an extensive bibliography, divided up into types of book (general books about the revolution, biographies, books about specific battles, etc) but sadly, not a list of further suggested reading of books on the same reading level. Most (if not all) of the books listed are for adults. Good source notes and index! A great example of how to how to make history engaging and fun, while still being an excellent example of what non-fiction should be like. I just wanted to drool over the pictures instead of actually reading this one, but I *did* read it. As soon as I wiped off the drool. 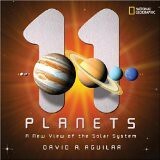 11 Planets is an in-depth look at our solar system-- the 8 planets we all know (Mercury, Venus, Earth, Mars, Jupiter, Saturn, Uranus, and Neptune) and 3 dwarf plantes (Ceres, Pluto and Eris) as well as looking at the moons of Earth, Jupiter, and Saturn, the Asteroid and Kuper belts, the sun, and things beyond our solar system. This is an excellent book introducing us to all the new changes in our solar system since they took away Pluto's planetary status. I especially liked the bit in every corner that showed a picture of the god or goddess the planet was named for, the planet's symbol, and a few sentences about who the god or goddess was. There's also a sentence about if there's a day of the week named after them! (Sunday is for the sun, Friday is after Venus in many romance languages, etc). This is a beautiful book showing different types of swords and sword-like weapons throughout time, and even looking at some non-European swords. Lots of excellent and beautiful drawings the kids will want to pore over all day. I could have gone for more text to help explain what I was seeing, but this is one the kids will love. Round up is at Chicken Spaghetti!